Black and Decker makes trapezoidal blades for utility knives that are cut from a long strip of finished aluminum that has a sharp end on one side. Between each trapezoidal blade that gets cut out there is another part of finished aluminum that is being discarded. The assignment was to make a new tool that uses the discarded remnant. We considered a variety of applications such as a box cutter, travel blade, and weed cutter, but ultimately settled on a ceramics tool since I actually use tools with blades for trimming ceramic pieces, as pictured below. The intended use is for trimming leather-hard ceramics on the pottery wheel and also for carving designs such as those shown below. 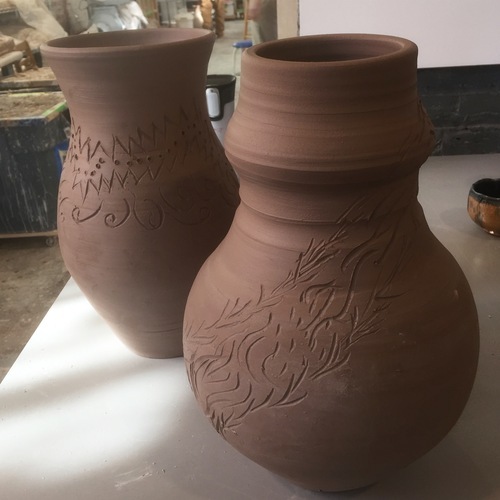 pictured below is the CAD file, final part, and ceramics with sgraffito designs. This tool works well, though it could be optimized further to be more ergonomic and fit in the cavity of my hand as I grip it. This was my first project designing something and then 3D printing it. 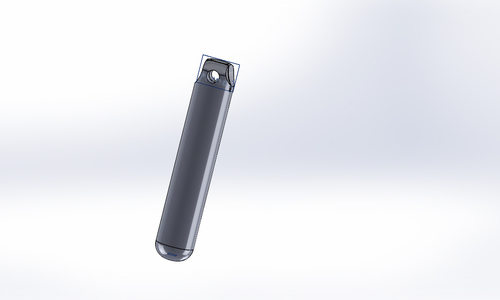 It was exciting to go from a model to a physical object, and I also learned the importance of triple-checking the length scale in CAD before printing so that it doesn’t come out the wrong size. 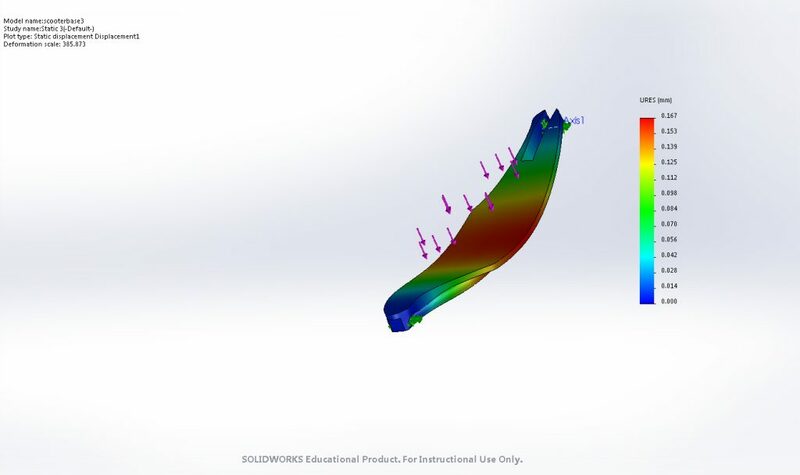 The assignment was to design a scooter base that can hold a 200 lb person with minimum deformation and at least a safety factor of 3. I originally chose to make the base out of wood, but switched to aluminum when I realized it was strong and more uniform than wood. 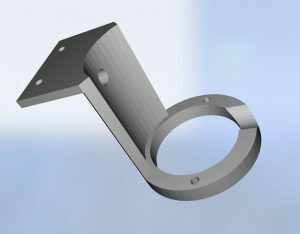 The scooter base in my final design (pictured below) is made out of 6061-T6 Aluminum. It has a mass density of 2.7 g/cm and the total mass is 2.32 kg. It measures 15 cm wide at the widest point and is 65 cm long. Below are the top, side, and bottom views of my scooter. 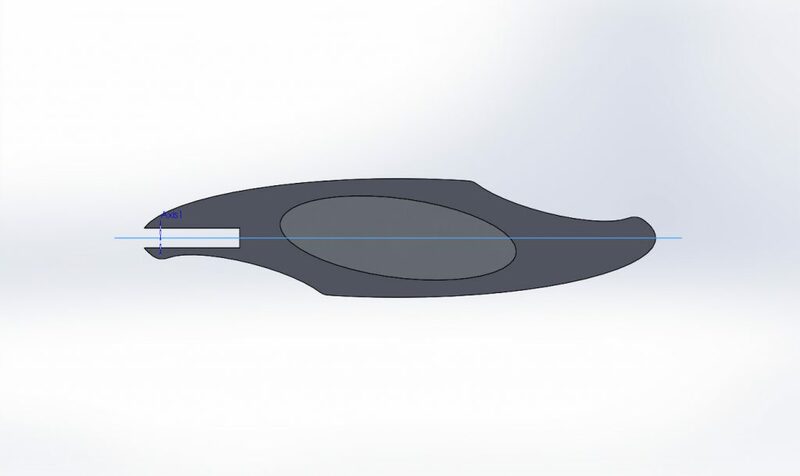 The oval in the middle is roughly foot size and would be where the 200 lb of force is concentrated on the scooter. 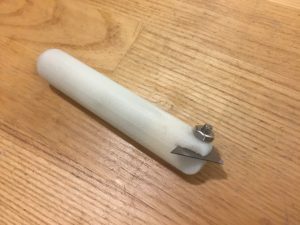 There are holes for pins on each side; on the back to attach to the axle of a wheel and on the front to attach to the handle stem. I ran some static studies on my scooter design. I found that this design was much stronger than minimum requirements and had a minimum factor of safety of 7.1. Since the base weighs roughly what a real scooter weighs, I thought this was pretty good. I found that the scooter performed very well with displacement also. As expected it deformed the most where the weight was applied, but even so that is less than .167 mm. The scooter also has a very high yield strength: most of the results are in the blue range of almost 30,000 N/m^2, and the places near the hinges where it is slightly weaker still yield results of 2.27 x 10^7 or above. The overall takeaway from comparing the rectangular scooter to the design I actually used is that while the rectangular one has a higher FS, it actually deforms more. 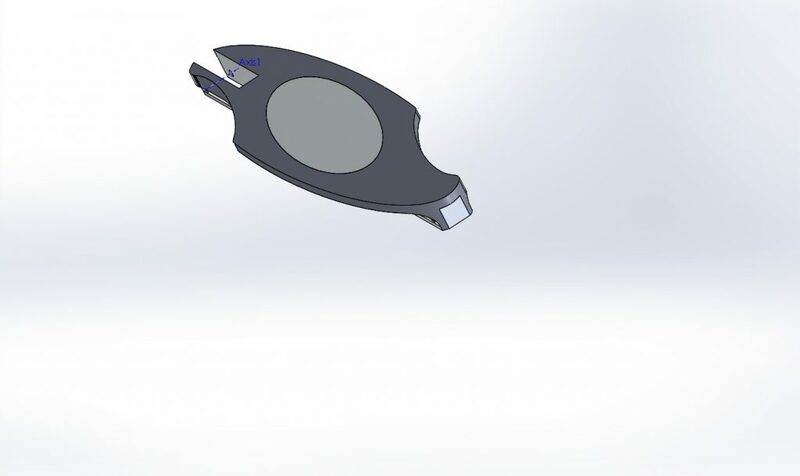 Both of these designs are very strong within the weight of a real scooter and the specified dimensions, so the next step to optimizing the design even further could be to make them a bit lighter. 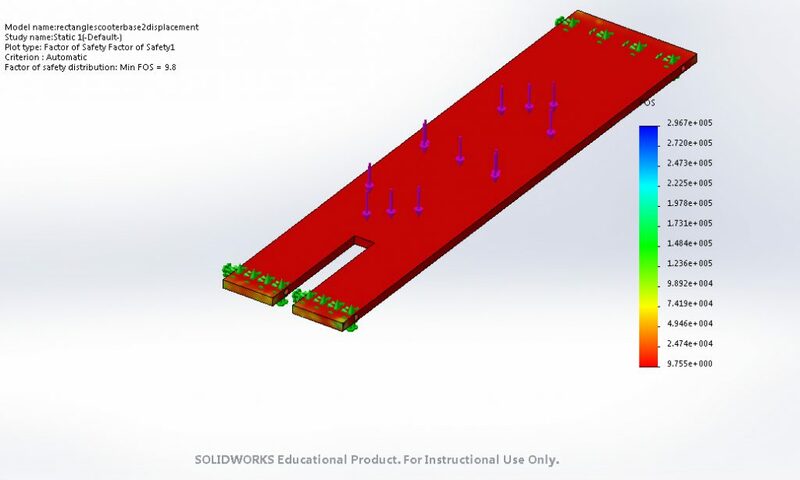 In this project I learned how to place a force distributed over an area, and about factor of safety and finite element analysis. Because the factor of safety is so much higher than required, I didn’t have to worry about where the object would break. I was still so impressed by the tools available to visualize stress and strain. Instead of calculating stress at a point analytically, it was useful to be able to see the stress plotted out in colors over the whole area of the scooter. 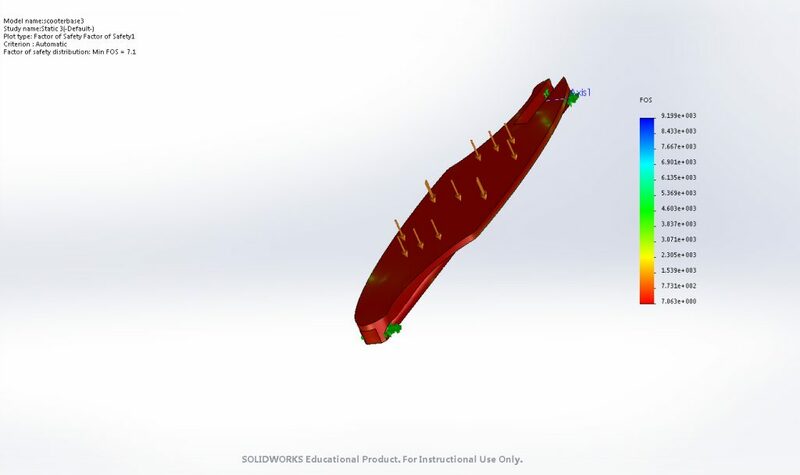 It also sped up the design process tremendously to be able to use SolidWorks to recalculate the stresses every time I changed the shape. It was also useful to be able to visualize the strain at each point as a gradient and to see the deflection. 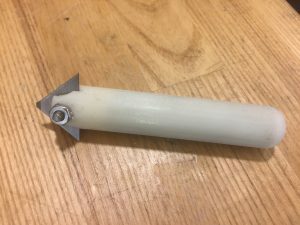 I made a linear drive wherein a motor turns a screw to generate linear motion in a carrier mounted on the screw. 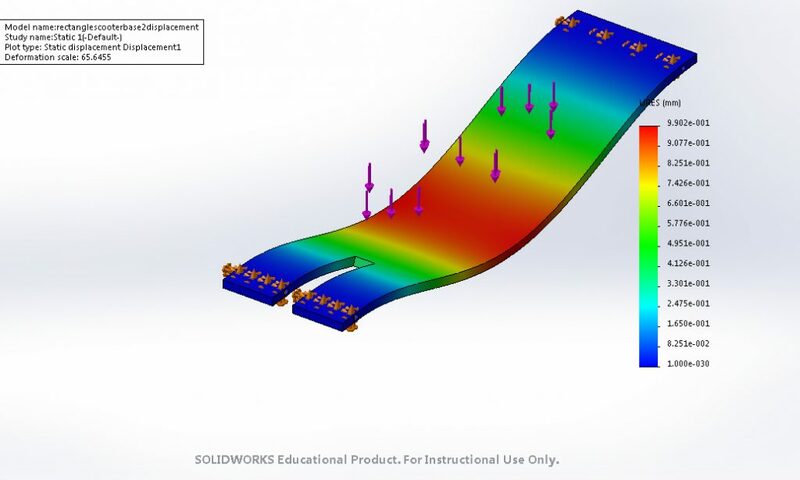 Using SolidWorks motion analysis I combined four linear drives together to move in all 3 dimensions. 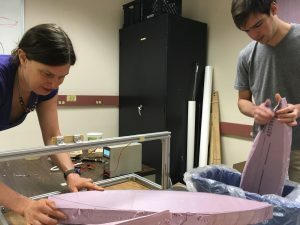 The goal of this project was to simulate the basis of the range of motion of a 3D printer. In this video the extruder tip of the printer traces faces of a cube and demonstrates motion in all three directions backwards and forwards. 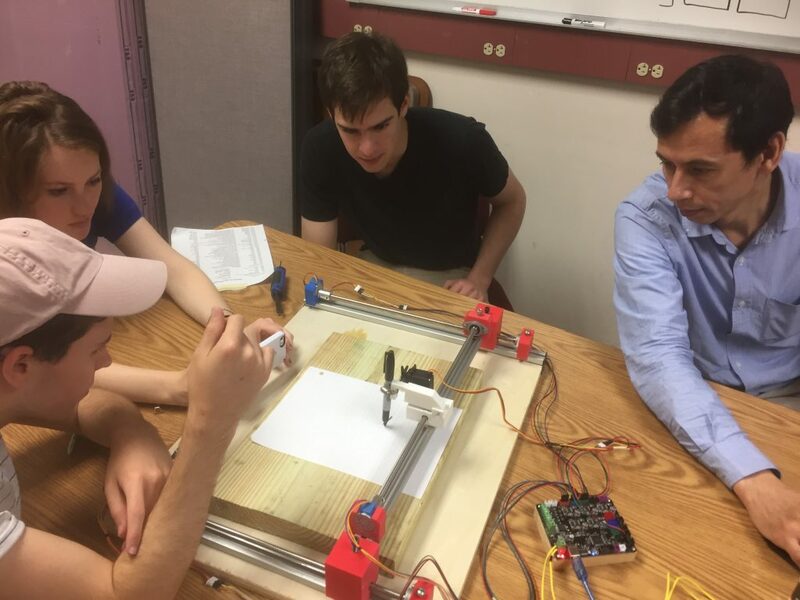 After simulating a combination of linear drives to be a 3D printer, our team made one. 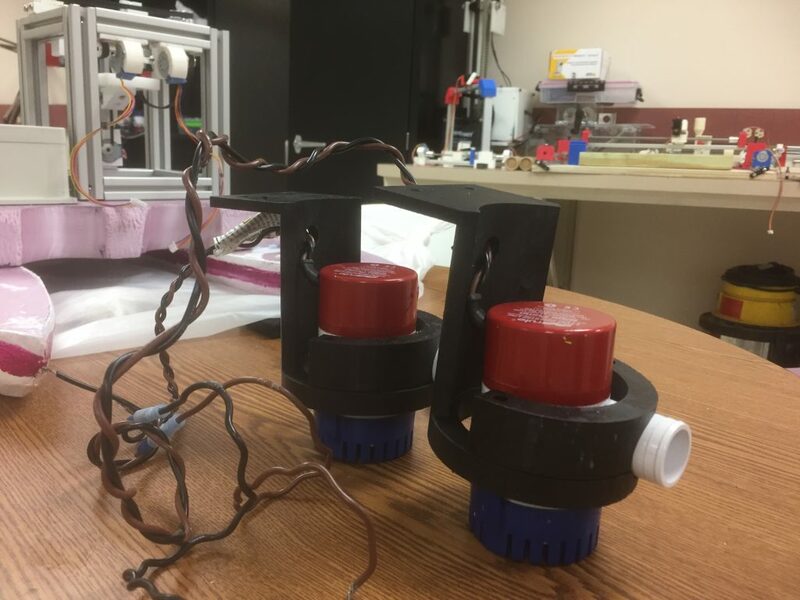 Because in real life there is friction and gravity, the 3D printer we made looks slightly different than the one simulated above, but the idea is quite similar. It was challenging to visualize how we wanted to attach the linear drives to each other. 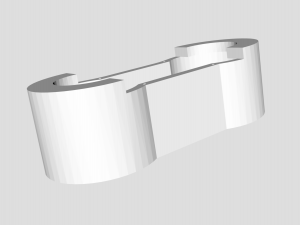 In fact some of the pieces had to be printed more than once because we had oriented slots or holes incorrectly. While we did check geometry several times before printing, there were several nuances about how things fit together that we discovered during assembly. Luckily it was possible to reprint the pieces. The trickiest piece that involved several iterations of testing is the spring loaded piece to lower the pen. We had to make the pieces fit together such that the spring would be partially compressed without any force on it and so that the pen lowers when the servo propellers turn and push on it. Here is our team testing our 2.5D “printer” that has a pen instead of an extruder tip. 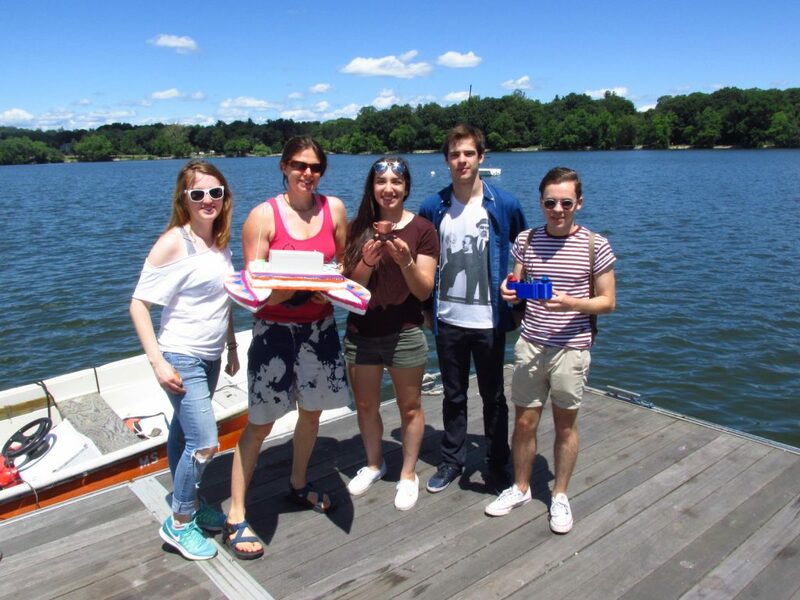 In conjunction with other research being conducted at BU, our job was to create a remote controlled boat capable of carrying an acoustic sensor. The motivation of the larger BU and Navy collaboration is to create swarms of acoustic sensor platforms to detect illicit submarines moving through the ocean. 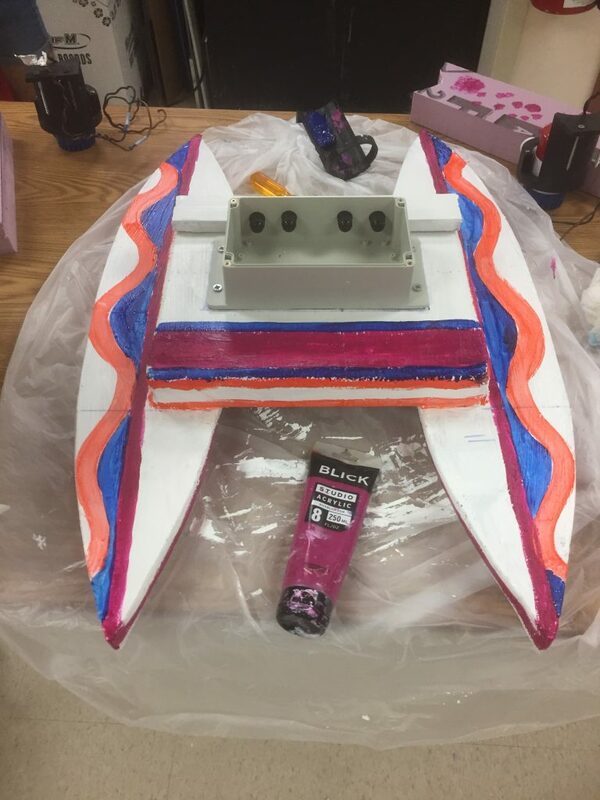 According to the specifications for this project, our team built a boat out of 2″ Owens corning Foamular with 2 bilge pumps powered by a 14V battery for propulsion. We controlled the boat remotely by setting up an Xbee relay and two Xbee shields with arduinos on the boat and the controller to turn the pumps on and off. There was one 9V battery powering the arduino and Xbee system in the boat and another powering the arduino/Xbee system in the controller that we operated from land. That way we could stand on land and press a button to have the left pump go off and another button for the right pump. 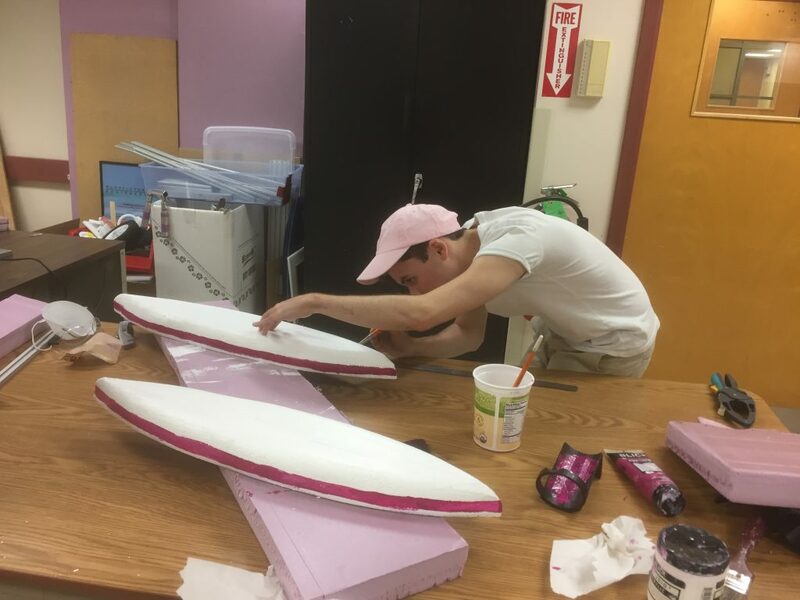 Our group chose the catamaran design because it would be stable, sturdy, and straightforward to construct with the 2″ foam. 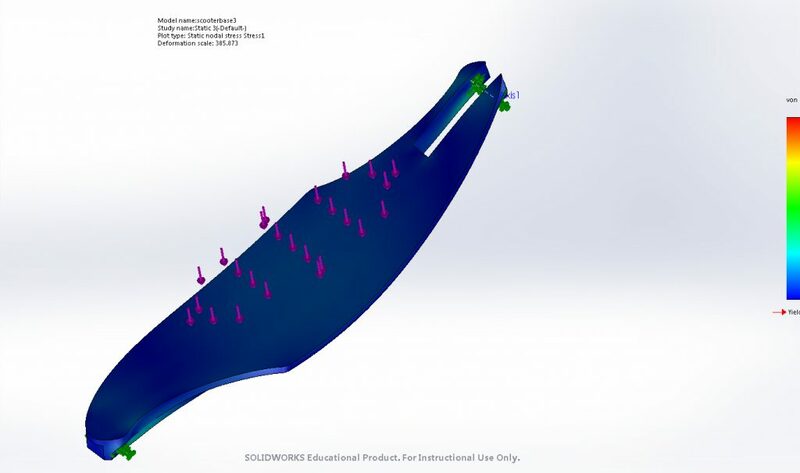 We modeled the design in Solidworks and did a flow simulation. 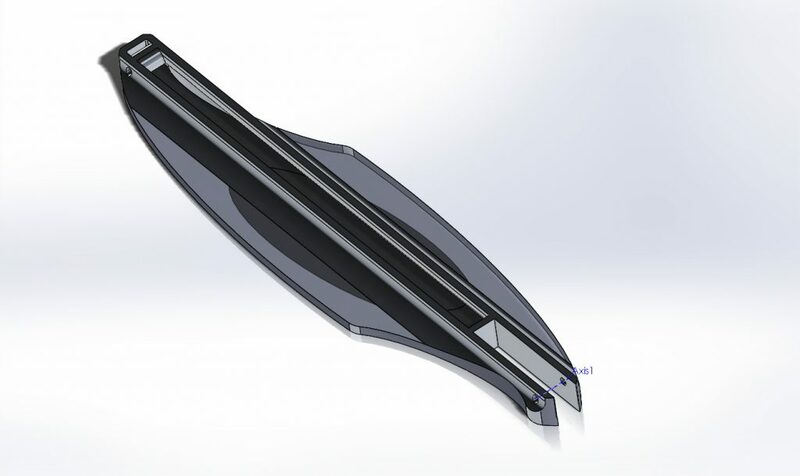 We calculated the overall mass of the boat and components (1.86 kg) and found that given the foam’s low density of 1.3pcf, the boat would sit high in the water with minimal displacement, just as we wanted. Our boat design and operation team on race day. I am holding the boat, Katia is holding our racing trophy, and Diego has the controller. Most of the boat was hand cut using a hot wire and then sanded. 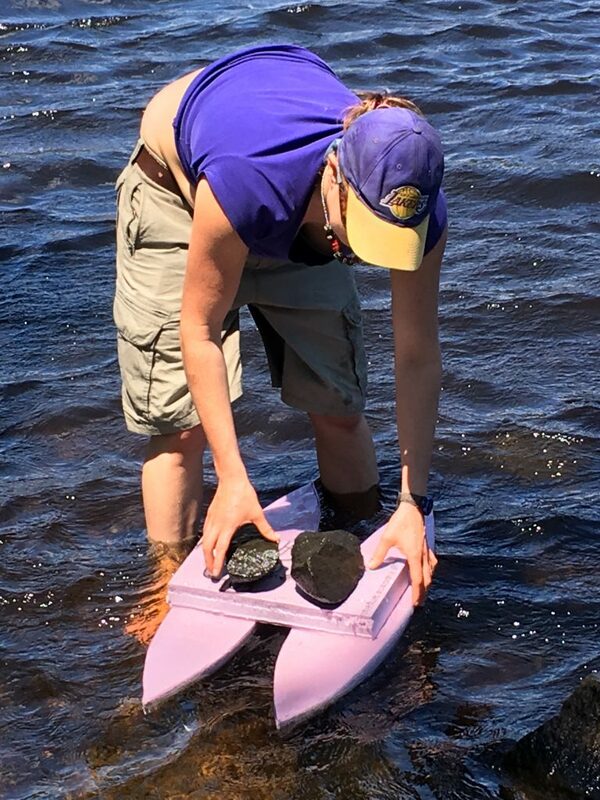 I tested the pieces in the Charles River before finishing sanding in order to see if there were any bubbles or places where it seemed the water wasn’t flowing as smoothly. This was a qualitative test that helped inform subsequent sanding decisions. Once we were satisfied with the pieces, we glued, painted and sealed them. We drilled holes for the pump wires into the watertight electronics box and sealed the holes with a watertight connection so that the wires could pass through without the electronics box getting wet. Meanwhile, we also designed and 3D printed the holders for the pumps and the controller. Our teammate Katia wrote the arduino code and set up the relays and shields. Then we assembled the electronics with the boat. Because of the limited time to complete this project (1.5 weeks) and team members’ other commitments and geographic constraints (some live far away from school), it was essential to agree on project flow and assign and divide tasks early on while keeping communication open. We were highly successful at dividing up the work and bringing it back together as a team. Our other big success was a lot of testing led to expected race day results. Not only did we test the boat pieces in the river, but once the boat was assembled, we tested all of the electronics in the classroom. Once we were satisfied with performance in the classroom, we tested in the BU pool. Although the boat didn’t drive quite as straight as would have been optimal, we decided to leave it as is because it worked well and we didn’t want any unforeseen problems on race day. We performed as expected on race day (which was our ultimate goal) but still had some difficulties with the steering. Our team’s strengths were teamwork, division of labor and testing. We do think we could have improved speed and steering agility by having the pumps farther away from each other. We also might have gotten better speed without a reduction in stability by making the pontoons a bit longer without increasing their width or the distance between them.